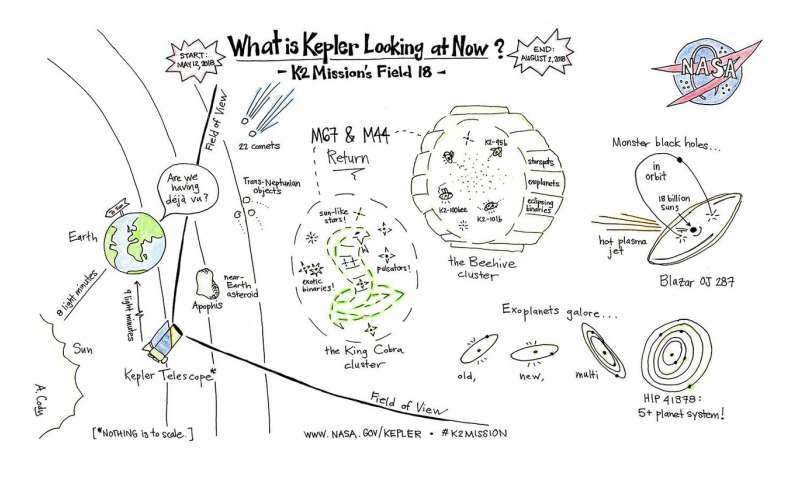 NASA's planet-hunting Kepler spacecraft began the 18th observing campaign of its extended mission, K2, on May 12. For the next 82 days, Kepler will stare at clusters of stars, faraway galaxies, and a handful of solar system objects, including comets, objects beyond Neptune, and an asteroid. The Kepler spacecraft is expected to run out of fuel within several months. Campaign 18 is a familiar patch of space, as it's approximately the same region of sky that Kepler observed during Campaign 5 in 2015. One of the advantages of observing a field over again is that planets outside the solar system, called exoplanets, may be found orbiting farther from their stars. Astronomers hope to not only discover new exoplanets during this campaign, but also to confirm candidates that were previously identified. Open clusters are regions where stars formed at roughly the same age, including Messier 67 and Messier 44, otherwise known as Praesepe or the Beehive cluster. Home to six known exoplanets, the Praesepe cluster will be searched anew for objects that are transiting, or crossing, around these and other stars. At approximately 800 million years old, the stars in Praesepe are in their teenage years compared to our Sun. Many of these youthful stars are active and have large spots that can reveal information about a star's magnetic field, a fundamental component of a star that drives flaring and other activity that may have influence over habitability. By comparing brightness data collected in Campaign 18 and 5, scientists can learn more about how a star's spots cycle over time. At several billion years, the Messier 67 cluster is much older and has many Sun-like stars. It is one of the best-studied open clusters in the sky. Astronomers will continue their studies of stellar astrophysics by analyzing Messier 67's stars for changes in brightness. They will search for the signatures of exoplanets, observe the pulsations of evolved stars, and measure the rotation rates of many other stars in the cluster. Beyond these clusters, Kepler will observe blazars, the energetic nuclei of faraway galaxies with black holes in their centers. These objects propel jets of hot plasma toward Earth (though they are far too distant to affect us). The most notable of these targets is OJ 287, a system hosting two black holes in orbit around each other, one of which weighs 18 billion times the mass of the Sun! Even closer to home, Kepler will look at solar system objects, including comets, trans-Neptunian objects, and the near-Earth asteroid 99942 Apophis. This 1,000-foot chunk of rock will pass within 20,000 miles of Earth in the year 2029—close but still comfortably far enough to not pose any danger to Earthlings.